" The most enjoyable live-action family film since holes"
" A simple pleasure from start to finish." Special introduction with the Pinewood Derby history. Interview with Don Murphy, Pinewood Derby founder. Video description of a typical Pinewood Derby race. Photo coverage of the Hollywood Premier. Free - Limited edition collector's patch while supplies last! This comedy pokes fun at the parents who go to any length to compete with one another through their children. A social dynamic seen in everyday activities ranging from little league to beauty pageants to science fairs. Ever since the fifth grade, Phil Davis and Ace Montana were competitors but Ace has always come out on top. Ace is the perennial winner while Phil's best attempts to win continue to fall short. Now with children of their own, they find themselves in familiar competitive situations. On the heels of his son's defeat to Ace's son in the city league basketball championship, Phil is more determined than ever to end his streak of losses to his childhood rival. The next day, news of the upcoming Pinewood Derby race is announced and Phil's son, Brady, races from his Pack meeting to solicit his dad's help. Desperate for a win, Phil sees this event as his chance to finally beat Ace, whose son is also a Cub Scout. Surrounded by overzealous dads in the same neighborhood, they go all out to build the fastest car in the world. In the crazed world of derby fever, the kids are lucky if they get to pick the paint color or attach a decal. 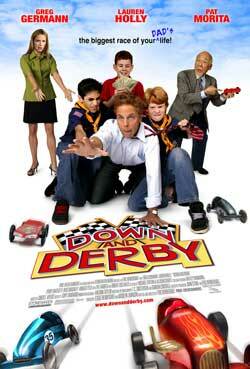 Hilarity builds as the dads teeter on the edge of insanity in their quest for the ultimate Pinewood Derby car. In the end, the farce reaches comical and outrageous levels with a surprise twist that will have you on the edge of your seat!